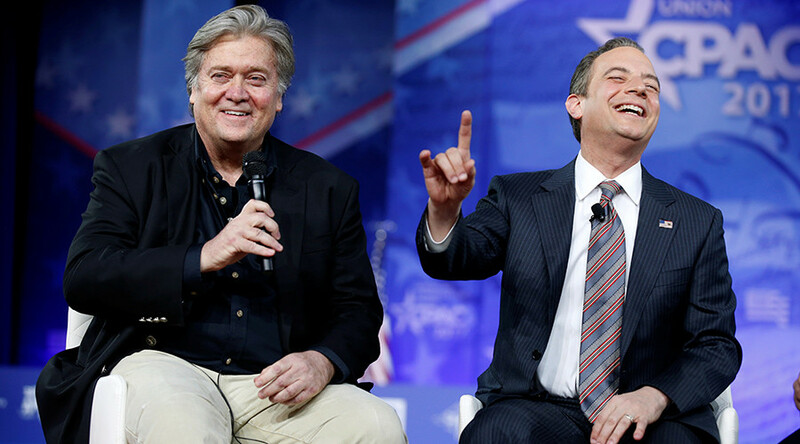 Rumors of divisions within the White House were either dispelled or proven depending on who was watching, when President Donald Trump’s chief strategist Stephen Bannon and chief of staff Reince Priebus took the stage at CPAC. Vice President Mike Pence and Education Secretary Betsy DeVos also addressed the event. On Thursday at the 2017 Conservative Political Action Conference (CPAC), Bannon and Priebus sat down with Matt Schlapp, chairman of the American Conservative Union, which hosts the annual gathering of thousands of activists. The “big moment,” as the interview was cast, began with a question on media accuracy. Reports of feuding between Bannon, former executive chair of Breitbart News, and Priebus, former chair of the Republican National Committee, were downplayed immediately. Not all who watched the interview were convinced. Some took issue with the interview overall, while others praised it. Bannon is really smart. A critical part of the Trump agenda is "The deconstruction of the regulatory state." The vision goes beyond changing America over the next four years, but “potentially over 40 years,” Priebus said, citing Supreme Court justice nominee Neil Gorsuch and Trump’s executive order putting into place a “constant deregulatory flow” where two regulations are repealed for every new one implemented. Bannon and Priebus each highlighted different issues, with Bannon sounding off on more nationalist appeals than Priebus’ traditional points. “We’re a nation with a culture and a reason for being,” Bannon said. Priebus did hit the media just as hard as Bannon, explaining that reports on Trump during the campaign were inconsistent with what he heard back home from neighbors. But Priebus did share his feeling that the media might learn from its mistake. Bannon, however, was less optimistic, predicting the coverage would only get worse. “If you think you’re going to win this country back without a fight, you’re mistaken,” Bannon said. CPAC attendees weren't always on team Trump, as Senator Ted Cruz (R-Texas) won their presidential straw poll last year, but it seems like that could be changing, as other administration officials were well received. Later, closing out the second night of the conference that runs until Sunday, Vice President Mike Pence rallied the audience with, you guessed it, more media bashing, before moving on to Trump's Cabinet picks, and promises to "rebuild the military and restore the arsenal of democracy." Department of Education Secretary Betsy DeVos also spoke Thursday, calling President Barack Obama's transgender bathroom guidelines an "overreach" and affirming that her job "isn't to win a popularity contest."